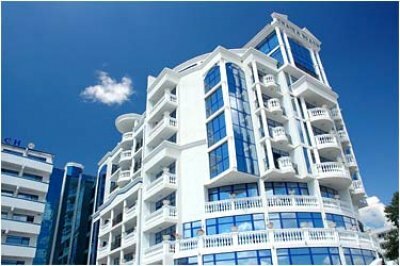 Location: The Chaika Beach Complex 4* is situated in the prestigious Sunny Beach - the biggest Bulgarian Black Sea resort. 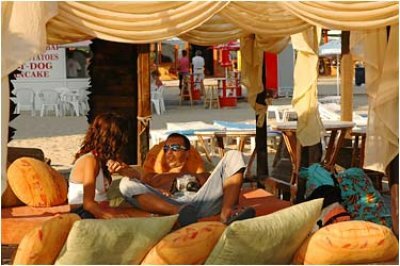 The hotel is located right at the beach line, facing the resort promenade. Accommodation: Hotel Chaika Beach offers to its valuable guests: 2 VIP suites, 14 spacious suites, 100 studios, suitable for families, 299 double rooms, 8 single rooms .All rooms have telephone, SAT TV, mini bar, bathroom with bathtub and hairdryer, air conditioning. Most of the rooms are sea-view and have balconies. 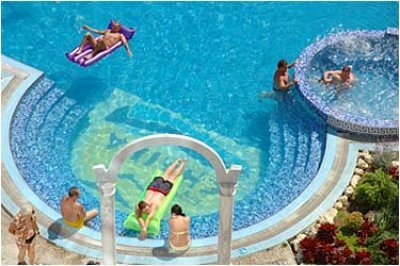 The Chaika Beach Complex 4* provides nice facilities for leisure time. There are restaurants, 24 hours room service by multilingual personnel, free guarded parking lot non-smoking rooms / floors, medical service, large outdoor swimming pool and kids’ pool, shopping outlets, currency exchange, internet club, hairstyle studio. I am going to this hotel in June 2011 with my partner, my daughter and my step-son. Honestly, I have read a good few websites to get a good review and some people make me sick with how much they complain. At the end of the day, this is obviously a busy hotel, and you have to think, could you do much better?? If you want the best of the best you have to pay top prices so judging by comments - You get what you pay for. People have complained about the most ridiculous things, you dont go on holiday to spend all your time in a hotel ne ways, so you only have to eat, sleep and enjoy the pools/ entertainment. You find pimps/prostitutes and theives/guys trying to sell you stuff EVERYWHERE. Benidorm is a massive, excellent fantastic resort - but you cant turn a corner without being begged too.Just walk away - you find them in London these days. Also, as for finding salt and pepper - if you found it the first day it shouldnt be a hassle finding it again the 2nd, 3rd so on, its more than likely kept in the same place. I have had family who have stayed here and they have said that the service was great, rooms were fab and so was the place its self. Pot holes in roads/streets are everywhere, go outside and you will find one within a mile of your home, thats not the hotels fault!!! I cant wait to go to this hotel I am really excited and the bad comments are only making me want to go more. A holiday is what you make it - if you sit and pick at everything then your going to feel let down - STOP MOANING and make the most of what youve got!!! You can't fault this hotel for the Decor and service. It was truly beautiful. However I am leaving this review as a warning. Before our departure we left our luggage in the "secure" locker room that only the porter has access to and when you go to get something follows you in and watches you retrive your own luggage. when we came to leave I went in my bag to retrieve some perfume. It wasn't there! Someone had been rummaging through my luggage. I asked my husband to check his bag. He too had some aftershave gone and the lock on his suitcase had been broke and someone had gone through that. I asked the othye holiday makers to check theres. Everyone had one item missing! If you got home and realised you would have just thought you had forgotten it but for everyone to be missing something it was too much of a coincidence. we informed reception and they took the porter aside speaking to him in bulgarian and then he left. The hotel refused to comment aor call the police. In my opinion this is something they do on a regular basis. So I am warning you. Keep an eye on your luggage!! Just back from staying a few hotels along the coast. 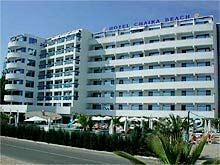 Chaika Beach (means seagull) was in a perfect location, right on the beach front and quite central to rest of resort. The rooms were pretty basic, but clean, with slippers and bathrobe. The food was fine, decor of reception questionable... However, Iberostar hotels, on the otherhand, are miles better. The one at Tiara Beach was the best of the three we stayed in. I loved the hotel and i sometimes finds it very irretating that people complain about finding salt and pepper and no sunbed :=) Its AMAZING how little experience people have of the world and how to live it in the best way. I have to laugh about comments like this sometimes..
We're off to the Hotel in September and would like to know if it is a generally safe area (ref pimps and prostitutes fighting outside the hotel). Also having done Greece and Turkey in the past, is the weather similar at this time of year (25 Sept)? We have just come back home from Chaika Beach Hotel. Seeing all the prostitutes and their pimps fighting with the clients in front of the hotel spoiled our holiday. I have just returned from the a/m hotel. My experience I regret to say was NOT a good one. When I requested extra pillows I was told to find the chambermaid myself. Not once in the seven days did we get a sunbed at the pool. When I enquired if the hotel had a policy about guests putting towels on beds and coming back when they felt like it I got a shrug of the shoulders. The pool beds are totally inadequate. Black insects walking around the room, up the curtains and in the bathroom. After trying very hard not to break an ankle in the pot holes on the paths around the resort you get your ear drums seriously assaulted by the entertainment in the "Irish Bar". At 20 past midnight the barman showed us a sign that read "STOP" . No more drinks and we had to vacate the bar. The view from the bar next door is of the prostitutes walking up and down the foothpath. Looking for salt and pepper every meal was irritating to say the least. We spent two weeks on hotel Chaika Beach. Very good hotel and friendly people working there. Food was (too:) ) delicious. Special thanks to girls in money exhchange.